Reproducible data are key to science, so scientists are used to repeating experiments to confirm their findings. But no scientist wants to repeat an experiment because of poor reagent quality. To make sure our AAV vectors are of the highest quality, we undertake a rigorous quality control process - read on to learn more! Why Should You Care about Viral Quality Control? AAV vectors are produced by scientists - not robots. Unfortunately, humans have been known to make mistakes. What if a tube is mislabeled or someone grabs the wrong plasmid? What if bacteria snuck into the prep during the production process? These questions are especially important when producing multiple vectors in parallel because the risk of accidental errors increases. In addition to human error, fragments of DNA from the helper plasmids or the cell genome can be packaged inside the vectors during production. These impurities cannot be removed during the purification step because they are inside the virus itself. While these impurities are generally considered innocuous for research-grade vectors, we’d like to make sure they are present at a very low concentration. So how do we make sure to catch these all of these potential mishaps before distributing the vectors? Thanks to our collaboration with seqWell, we can now use NGS to sequence all the DNA packaged inside the viral particles (Figure 1). 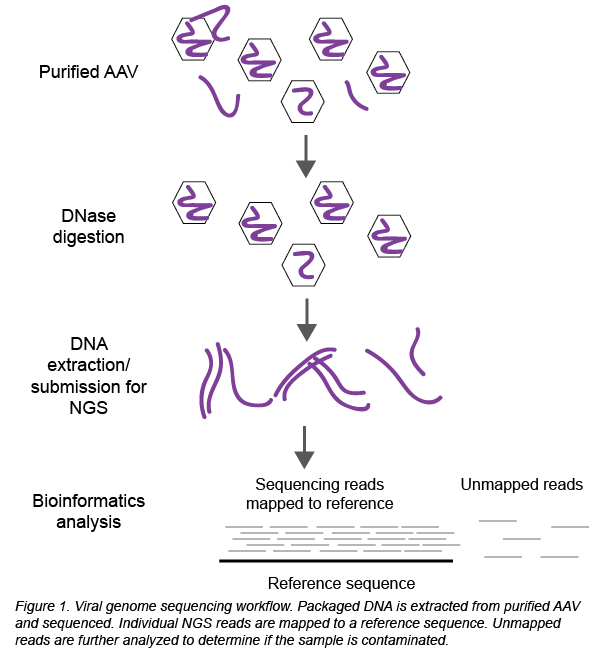 Briefly, packaged DNA is extracted from purified, DNAse-treated AAV and submitted for NGS. Raw sequencing data is analysed to determine the identity of the packaged DNA and look for potential contaminants. First, the individual sequencing reads (~150 bp each) are aligned to the reference sequence of the plasmid used to create the viral prep. 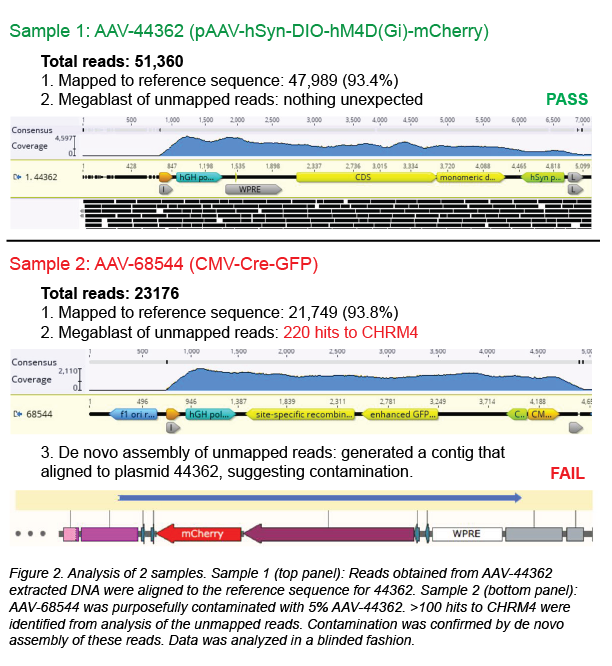 In a clean viral prep, like AAV-44362 shown below, more than 90% of the reads should align to this reference sequence. Second, we perform a megaBLAST search on all the reads that did not map to the reference sequence. The resulting list of hits is then carefully reviewed. As mentioned earlier, it is common to find DNA from the packaging cell genome, bacterial genomes, cloning vectors and helper plasmids (1,2). In fact, the majority of hits come from these known impurities, as was the case for clean sample AAV-44362. In addition to these expected hits, we always get hits to “random” genes. Do these hits always mean the sample is contaminated? No - what really matters is the number of hits to the same sequence (gene). In a clean sample, there are typically fewer than 10 hits to a given sequence, and we believe this isn’t cause for concern. However, a large number of hits to one sequence/gene - we set our threshold at > 100 hits - immediately raises a red flag. For example, AAV-68544 contained 220 hits to the CHRM4 gene. When contamination is suspected, we proceed to de novo assembly of the unmapped reads, employing our bioinformatics software to assemble the reads into longer DNA contigs without using a reference sequence. The 5 contigs with the most total reads are most likely to correspond to the contaminant. Each contig is then BLASTed against the NCBI nucleotide collection database, and it may also be aligned to plasmids in our inventory containing the suspected contaminating sequence. In most cases, the source of the contamination can be identified, and we will discard any AAV prep we suspect is contaminated. For AAV-68544, the best match for the contaminant is Addgene plasmid #44362. How did AAV-68544 become contaminated? Well, we purposely mixed another AAV vector with AAV-68544 to validate our method. We then extracted the DNA and processed the mixed sample in our pipeline (see Figure 2, sample 2). When we blindly analyzed AAV-68544, we were easily able to identify AAV-44632, the contaminant we mixed into the original AAV sample at 5%. Detecting 5% contamination is a good start, but we are also working to improve our detection limit. We are currently testing mixed samples with as little as 0.1% contamination to determine the sensitivity of our method. We are currently working to adapt our VGS method to plasmids containing Lox sequences for Cre-mediated recombination. These sequences may be subject to Cre-independent recombination during plasmid growth in bacteria, with recombination producing a minor pre-recombined plasmid population that does not require Cre for transgene expression. Once packaged in AAV, this pre-recombined DNA could lead to transgene expression in Cre-negative animals, producing misleading results. We are hoping to be able to detect these events with VGS in the near future. For now we are conducting identity PCR (ID-PCR) on all our AAVs with primer pairs designed to detect recombination events. Next-generation sequencing (NGS) is a powerful tool that can be used to identify DNA contaminants in AAV preparations and provide information on these DNA species with exquisite detail (3). This higher level of quality control is recommended but not yet required for clinical-grade materials, and is not commonly performed for research-grade materials. Addgene is going the extra mile and pioneering the systematic use of this new QC assay to guarantee that you receive the best AAV vectors for your research. Please use the comments section below to let us know if you have any specific questions about viral DNA NGS you’d like us to discuss. We are also available by phone or at help@addgene.org to answer your questions about our quality control process! The images in this blog post were created using Snapgene and Geneious software. 1. Chadeuf, Gilliane, et al. "Evidence for Encapsidation of Prokaryotic Sequences during Recombinant Adeno-Associated Virus Production and Their in Vivo Persistence after Vector Delivery." Mol Ther. 12(4) (2005): 744-53. PubMed PMID: 16023415. 2. Wright, J. Fraser and Olga Zelenaia. "Vector Characterization Methods for Quality Control Testing of Recombinant Adeno-Associated Viruses." Methods Mol Biol. 737 (2011): 247-78. PubMed PMID: 21590401.